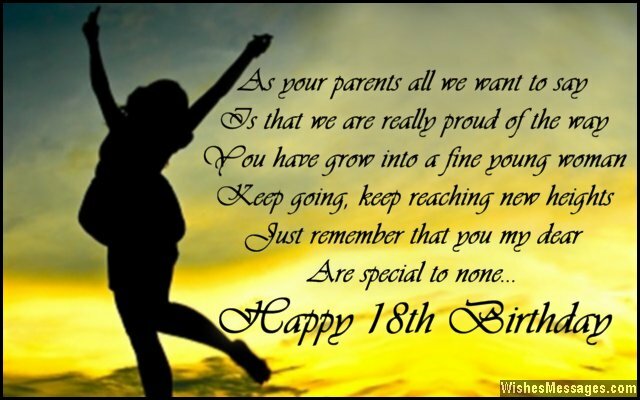 18th Birthday Wishes for Son or Daughter: Eighteenth birthday celebrations are the epitome of cute hugs, gifts and keepsakes that become the most beautiful lifelong memories. Whether it is for your son or daughter, write a personalized birthday greeting to be a part of this milestone birthday. From inspirational quotes to wise words of advice, and from funny messages to sweet emotions – help the new 18 year old embrace a carefree attitude and responsibility at the same time. Mothers and fathers take note – this post will help you bring touching words out from the corners of your heart so that you can scribble out one of the best birthday wishes you have ever written. Cherish this moment because in no time your little one will grow a pair of wings and move out for college. 1) Forget your breakups, forget your enemies, cherish your friends, cherish the memories. Forget your nightmares, forget your failures, cherish your love, cherish life’s flavor. Happy 18th birthday. 2) Nothing comes close to the joy of being able to make your own decisions – just like how nothing comes close to the burden of being responsible for them. Happy 18th birthday. 3) Eighteen is a tricky age. You have the freedom to do everything but the money to do nothing. Happy 18th birthday. 4) No matter how old you become, our arms are always open for a warm hug. Happy 18th birthday son. 5) Adulthood is the essence of turning eighteen, is to enjoy the last of your teens. So loosen up and live life to the fullest, let these years be your life’s best. Happy birthday. 6) Turning eighteen is about enjoying freedom on one hand and fulfilling responsibility on the other. I hope you can strike the perfect balance in doing both. Happy 18th birthday. 7) It does not matter whether you are eighteen or eighty one, you will always be daddy’s little daughter. Happy birthday. 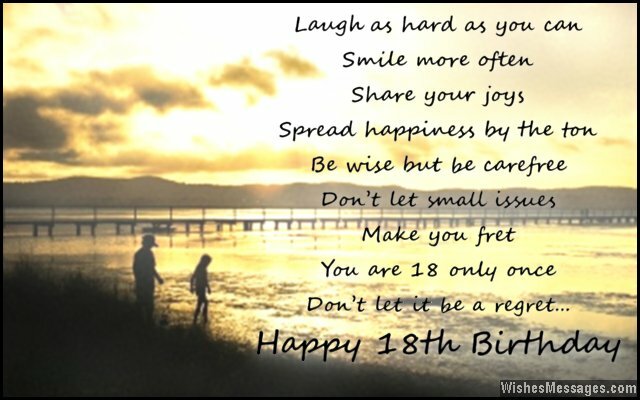 8) Turning 18 means that you are in-charge of your destiny, but don’t forget that with freedom, comes responsibility. Happy birthday. 9) Congratulations for finally becoming an adult. Maybe you want to start behaving like one too? Happy 18th birthday. 10) As you turn eighteen I just want to say one thing to you – always cherish your friendships and never betray love that is true. Happy birthday. 11) Living life after eighteen is the epitome of being bitter-sweet. The fun you will have from now on will go on to be the sweetest memories, but the hard work you will need to do to be able to have fun will be the most bitter of all struggles. Happy 18th birthday. 12) Make the most of your eighteenth while you can. Life is going to fly past and in no time you’ll be an old man. Happy 18th birthday. 13) All you need to remember as you turn is that you are beautiful and your happiness is too precious to be wasted on things and people who don’t matter. Happy birthday. 14) Cherish your friendships, never break someone’s heart. Remember your parents, who have supported you from the start. Happy 18th birthday son. 15) Selena Gomez, Harry Styles, Taylor Swift and Justin Bieber were making their millions by the time they turned eighteen. You have a lot to catch up to. Now stop partying and start working. Happy 18th birthday. 16) As your parents all we want to say is that we are really proud of the way you have grow into a fine young woman. Keep going, keep reaching new heights – just remember that you my dear, are special to none. Happy 18th birthday. 17) Eighteen is the age when you can do whatever you want, but at one condition – you pay for it. Happy 18th birthday. 18) Until you turn twenty one, here’s raising our orange juices to celebrate your eighteenth. Happy birthday. 19) You may have turned eighteen but always remember that your parents will never stop nagging and telling you what to do – simply because we love you. Happy 18th birthday to our darling daughter. 20) Happy birthday to the Prettiest, Sweetest and Cutest 18 year old that I have ever met. 21) Congratulations for turning eighteen. You can now officially demand the right to vote but you are officially banned from demanding an allowance. Happy birthday. 22) You may have officially become an adult, but in our eyes you are still our darling daughter who wants to sit on daddy’s shoulder and cry on mommy’s lap. Happy 18th birthday. 23) At eighteen, you are young enough to enjoy your mistakes and old enough to not make them again. Happy birthday. 24) It is true that these years will be crucial because they will be a stepping stone for your life ahead. Work hard but don’t forget to have fun so that the path to a successful future, you can happily tread. Happy birthday. 25) Say goodbye to fighting about your allowance with your parents on your eighteenth birthday. That’s because you won’t get any. Happy 18th birthday. 26) Your thoughts, actions and attitude today will become the foundation on which you will build the rest of your life. Make good decisions so that your future is free of strife. Happy 18th birthday. 27) Enjoy life to the fullest, but wisely. Go grab what’s in your destiny. Happy 18th birthday. 28) Do you think that your life will be peaceful from tomorrow because this is the last day your parents will be able to nag you and treat you like a child? Keep dreaming. Happy 18th birthday. 29) You have worked hard for your grades, you have never bullied your classmates and you don’t lie to your parents. Just keep doing the same thing that you have done so far, and your life will be perfect. Happy eighteenth birthday. 30) You may have turned eighteen and it may be the time when you finally move out. But we want to let you know that we will always be here for you – there’s no doubt. Happy birthday. 31) Laugh as hard as you can, smile more often. Share your joys, spread happiness by the ton. Be wise but be carefree, don’t let small issues make you fret. You are 18 only once, don’t let it be a regret. Happy birthday. 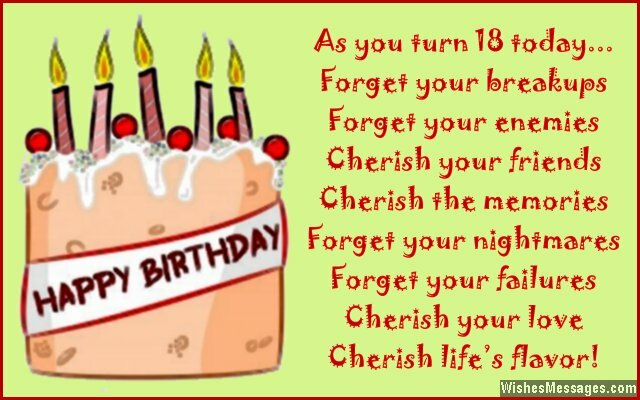 32) May you become wise on your eighteenth birthday because the decisions you make from now on will change your life forever. Happy 18th birthday to our dear daughter. 33) We know that you are eager to stop being a teenager, but make the most of your last two teenage years because this is the time when you will have the maximum fun and minimum worries. Happy 18th birthday. 34) Don’t make too much noise at home during your birthday party. You may have officially become an adult but your parents still have the legal right to throw you out of their house. Happy 18th birthday. 35) Are you eighteen already? We are quite surprised because you still behave like an eight year old. Happy birthday. 36) We know that you have always dreamed about the day when you will swipe your own credit card. Now that the day is finally here, you will realize that you also have to pay the bills after 30 days. Happy 18th birthday. 37) You will be called a grown up when you turn eighteen, but you won’t be called an adult until you take responsibility for your own life. Happy 18th birthday. 38) You are no longer a child at 17, but you are still a teenager at 18. You can officially drive any car you want, but you still can’t have a drink until you are 21. You are a responsible adult at 18, but you will still ask for allowance from us till you get a job. Welcome to the most confusing yet happiest stage of your life. Happy 18th birthday. 39) You are more mature at 18, than your parents were at 21. Take advantage of your maturity to spread your wings further. Fly higher and never look back as you live life to the fullest. Happy birthday. 40) Life begins at 18 – enjoy it. Happy birthday.